The US dollar last week gave us a breakout that looked promising for the equity bears but it was short lived. We can see from the chart below how it initially broke out and then capitulated. This led to the continued rallying of the US equity markets. We can see that we have had a more convincing breakout during the last few days. The USD has formed a 5 wave pattern and is currently held up by the overhead resistance just above the current price action. It is possible that we may see a bit of a retrace before another attack on that overhead resistance level. Doing a simplistic Elliott Wave count on the last rally pattern, the 5 wave rally may be either a wave 1 or a wave and the upcoming retrace may be either a wave 2 or a b wave. If either case is correct then it is entirely possible that the equities market may get another move up in the coming week. 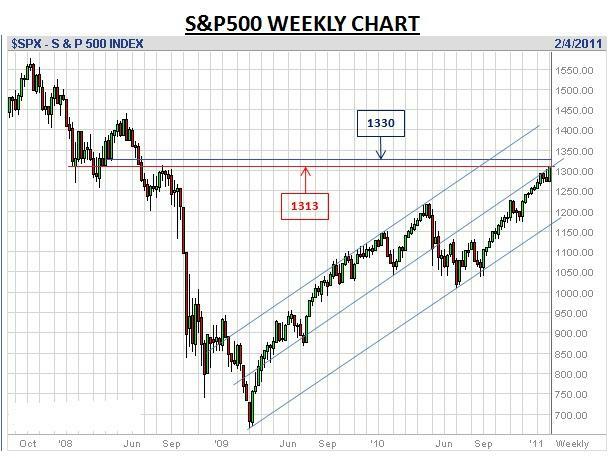 The following daily chart of the S&P500 clearly shows us that the index has been playing around between the 23.6% (1278.1) and 38.2% (1309.7) Fibonacci extension levels projected from the rally period of the 2 July 2010 to 5 November 2010. The 50% Fibonacci level is located at 1335.2. As indicated in my previous market wrap my target zone for the current rally was located between 1300 and 1313. Should the rally continue beyond that zone then the next obvious level is 1330 which is within 5 points of the 50% Fibonacci extension level mentioned above. 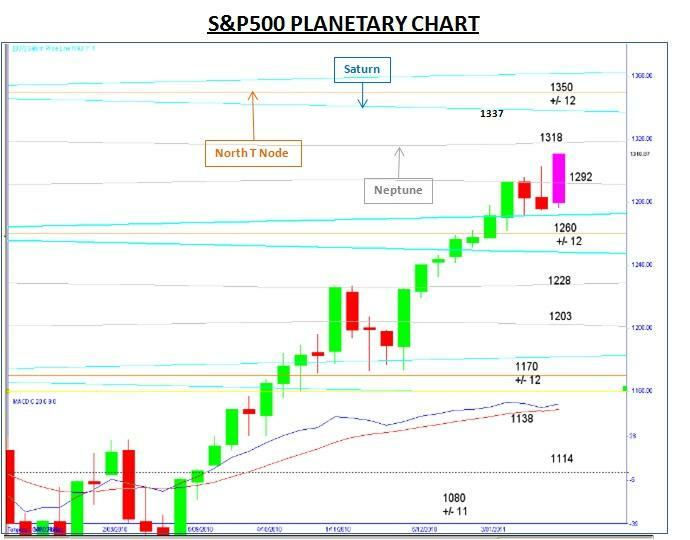 The following planetary chart for the S&P500 has a Neptune line at 1318 and a Saturn line at 1337. As can be seen from the chart the Saturn planetary lines often provide both resistance and support levels. 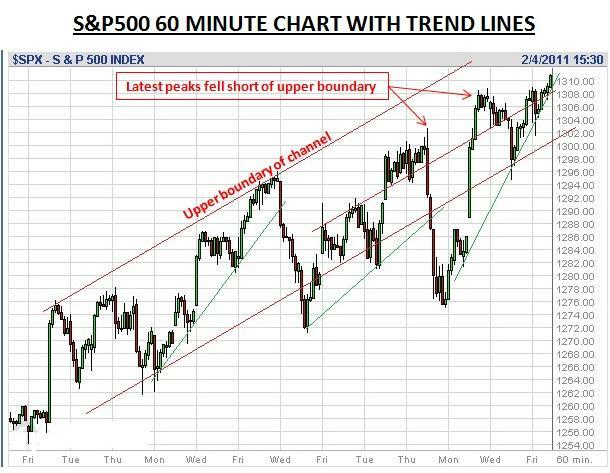 The following 60 minute chart for the S&P500 clearly indicates that the index continues to trend strongly in an ascending channel (see red channel lines). The green trend lines show the short term trends occurring within the broader channel. We can see from the above chart that the index did not reach the upper boundary of the ascending channel in the last two rally legs indicating a slight weakening of the momentum of the rally. The S&P500 closed at 1310.87 in its last trading session after having achieved a peak of 1311.0 intraday. Based on the potential retrace in the USD I would think that during the next few trading days the index would make an attempt to reach the 1313 level. Whether it has the strength to attempt the higher levels at around 1330~1337 or not remains to be seen as this rally leg is getting rather long in the tooth. With the lead from Wall Street the ASX200 futures contract is anticipating an 8 point move on Monday morning. Strangely, the ADRs on the NYSE have BHP down 0.67%, RIO down 0.61% and WBC down0.28% which would indicate a negative day. 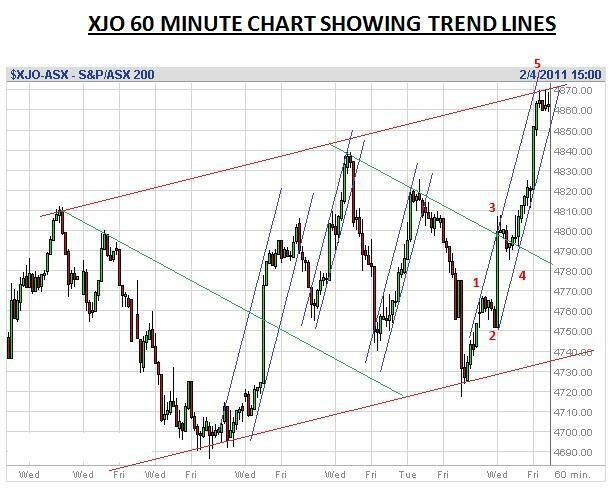 The 60 minute chart for the XJO below shows the trend lines that have recently been operating on this index. Note the similar rates of the upward moves (as indicated by the blue trend lines) and the fact that the last 3 peaks did fall close to the short term upper channel boundary (indicated by the red trend lines). Note also that the last move was a 5 wave impulsive pattern and I would suspect that it has almost reached the end of its current short term rally. Unlike the previous rally legs bounded by the blue trend lines, this leg has made the largest move in a single run. Whether is indicates a ‘blow off’ scenario remains to be seen but note that the last two high momentum rally legs have preceded a larger range retracement. Investors should carefully monitor this situation as a repeat of this action may occur again once the rally has peaked. 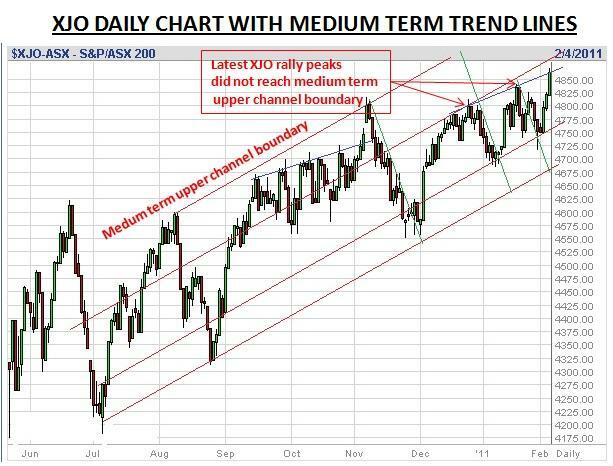 The daily chart for the XJO provides us with a view of the medium term channel that the index is contained within. We can see from this medium term view that similar to the S&P500 the index is moving within a medium term channel but the momentum is reducing. The planetary chart below has a possible Saturn line as a target at 4930. 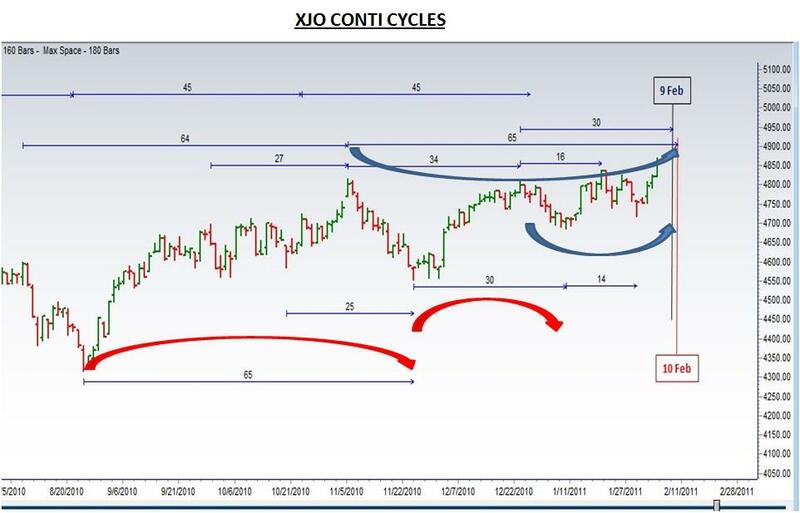 The EW count for the short term XJO pattern appears to suggest that we may be about to have a retracement after a 5 wave move that is nearing completion. The XJO nearing the upper boundary of a channel indicates the same thing. The Conti cycles below indicate that we could get a top somewhere around the 9th or 10th of February. The 9th February date comes from a 30 day Conti cycle and the 10th February comes from a 65 day Conti cycle. It should be remembered, however, that Conti cycles tend to have an accuracy of +/- 3 days so a minor new high on Monday would satisfy all methodologies. The S&P500 is continuing to trend quite strongly but is starting to lose some of its momentum. 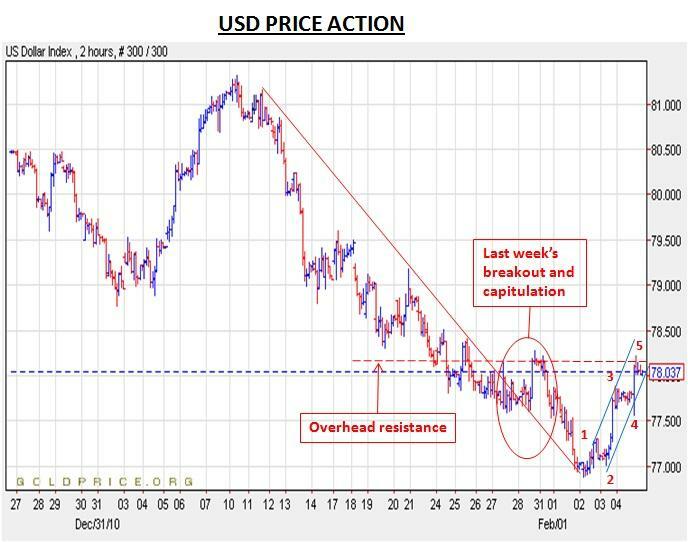 A potential retrace in the USD may allow the index to stage another move upwards early in the coming week. At this stage of the cycle, there are no clear indications that the index is about to have a significant decline as the short term trend lines remain reasonably solid. 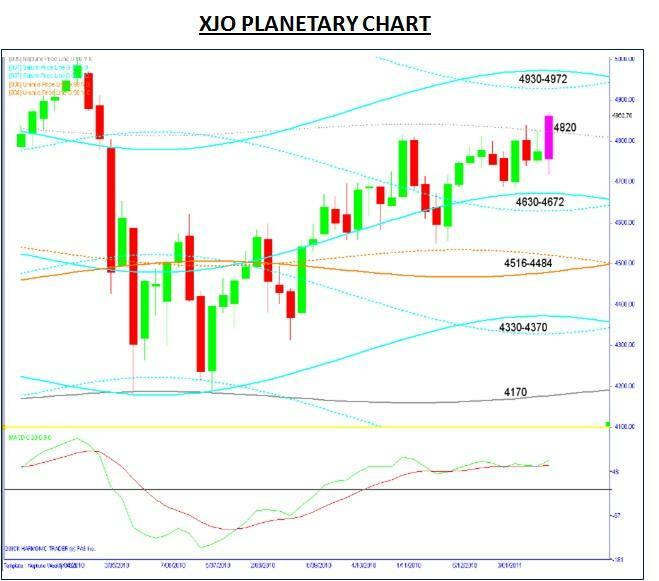 The XJO also continues to remain in a medium term trend channel, however, it does look like we may see the beginnings of a retrace coming sometime next week. How significant that may turn out to be will reveal itself in future price action.